Roma live under the threshold of poverty all over Europe. They have limited access to education and labour, which causes their life expectancy to be much lower than that of people in the majority and annihilates their self-esteem, thus determining them to repress their own identity. As members of an ethnic group which has been oppressed for centuries and continues to this day to be marginalized, Roma women have an even more complicated situation, as they are targets of multiple forms of discrimination: ethnic, gender and social. Most Roma women live their life inside this coordinates, trapped between the discrimination of the majority who see them as part of an “undignified,” “dangerous,” “primitive” ethnic group, as well as the discrimination of a patriarchal society (which maintains women in marginalization and silence, putting on their shoulders the burden of labour considered exclusively “feminine” as well as the burden of prescriptions inherent to “femininity”) and the discrimination of a society revolving around individualism, property and consumption (a society which needs the multiplication of capital, which is based on the continuing status of isolation and poverty of certain categories of people). Roma women of poor economic means live in a world in which discrimination, exclusion and marginalization seem to be an inevitable destiny, perpetuated for generations. They exclusively assume household and caring labour, they have precarious access to the health and education systems, they suffer physical and verbal violence because of their gender and ethnicity, they frequently live in improvised shelter, in perennial fear of being evacuated by the authorities or being put to fire by extremist groups. Most labour that Roma women have access to is rejected by the majority population as it is difficult and considered degrading. Their reproduction is deemed “dangerous” to the “purity of the nation.” They witness their children suffering the same discrimination as themselves, despite neoliberal discourse promising an apparent evolution towards a more democratic society. In recent years, a wave of negative reactions against Roma population in general and Roma women in particular can be noticed in Romanian and European mass media, thus confirming yet again that public opinion is still dominated by stereotypes and prejudice about Roma people. At the same time, recent studies show an increase in the level of intolerance of Romanian society towards Roma people. In this context, the presence of Roma women in the public European sphere continues to be a controversial topic. Relevant aspects of their lives are overlooked while traditional or antisocial elements are highlighted. Roma women are listed under “causes” of social issues and are not considered as persons whose life/condition reflects unjust public policies and cultural constructs. This leads to the construction of a false image which does not reflect the identities of Roma women. This phenomenon (of blaming) is not typical only to current Romanian society, but is deeply rooted in history, both Romanian and European. Roma women have been consistently presented, through the different media, in stereotypical and denigrating positions. These false images which do not reflect the identities of Roma women (but only the marginal situations in which they are placed by majority-led societies) have become a vicious circle which impacts not only the collective mentality, and thus lead to increased racism in society, but it also negatively impacts social mechanisms which shape the livelihood and horizons of Roma children. 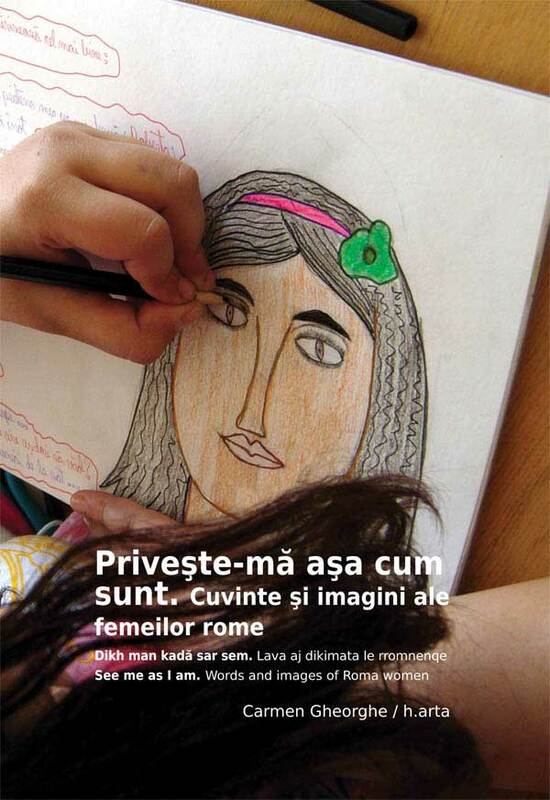 This brochure is the result of cooperation between a mixed group of Roma and non-Roma women and it proposes an analysis of Roma women in the Romanian and European culture and public space, looking at how this image and the processes by which it is constructed are connected to the appearance of stereotypes and the practices of marginalization and exclusion, and looking also at the ways in which Roma women may come to build a space of their own, free from racism and prejudice, where they can have their voice heard. The intersectional analysis of the situation of Roma women that this brochure presents is based on the awareness that us, those who have put it together, have the privilege of speaking from a favoured position, because we had access to education, because some of us are considered as “white” women, because we can freely express our opinions and desire to change the status quo. The voices of those who are marginalized, ignored, exploited, living in precarity, remain yet to make themselves heard. Bearing this in mind, this brochure – whose practical purpose is to be used in high schools for debating the issues of racism, sexism, marginalization and solutions to effectively address them – is addressed both to those marginalized, in hope that it will become an instrument of analysis and change, as well as to those in the majority, in the hope that it will determine them to become aware of their own privileged situation. Whether we talk about the privilege of being “white,” male, of higher class etc., acknowledging these privileges will open the perspective of truly challenging social hierarchies, which have been maintaining certain categories of people in marginalization for a very long time.